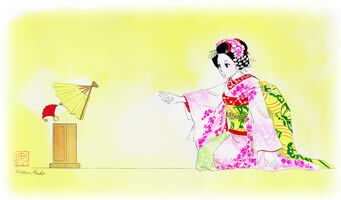 I am making a list of games played at an Ozashiki! Please help me add on to the list! And please let me know if you can explain it any better or know the names! The players take turns to take away the "tokkuri no hakama" bowl. If the bowl is not there, you show a fist. If it is there, you keep your hand flat. The geiko/maiko is "Hatsu" and the other player is "Katsugoro." "Hatsu" drags "Katsugoro"
around with a long peice of cloth. When no one is looking, they "make love." must take their penalty and drink the sake. This game keeps going on. beats the Tiger. The Tiger beats the Old Woman. 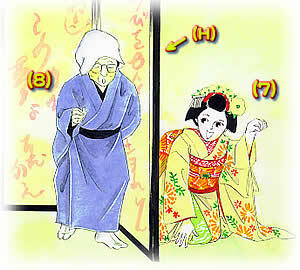 The Old woman beats the Samurai. The picture shows guests entertained by "Tosenkyo", a game played at Enseki (banquet) by throwing an opened "Sen-su" (Japanese tradition fan) at the target placed at a distance. The player sits on his/her knees, is throwing an opened fan at the target placed on the box set at a given distance from the player position. Played the same was as western Musical Chairs but instead of chairs you would use Zabuton. Okay this is an explanation and pictures of "Jan-Ken-Pon" / "Dontaku-san"
Basically its this. let's say there is a customer and geiko. The customer will play a doctor- specifically of obstetrics and gynecology. The geiko will play the patient. P:"Korewa korewa dontaku-san, soko wa hajika, izamazu koree"
D:"Shite shite yazen-no okusuriwa doudearo"
D:"Zuuki zuuki to shita dearou"
Patient(Geiko or Maiko):"I have been expecting you, doctor. Please come in"
Doctor(Guest):"Well, how about the medicine prescribed yesterday evening? It's may be good for you." Patient(Geiko or Maiko):"Oh! it's good for me, but feel pain." D & P:"Yoyoi-no yoi! Jan-ken-pon!" Sometimes too a winner of jan-ken-pon can ride on the loser's back but this may be a slightly different variation of the game. steam locomotives are above the iron railroad. Mr.Urashima(a hero in a fairy tale) is on the sea turtle. Cats' love affair is on the roof. I and you are on the bed. And then she ends up laying on him. This is a sort of a penalty game. penalty to drink a cup of Sake. After drinking, the new "ONI" does the same performance. This game goes on and on. This "Izari_Katsugorou" is a parody game from an old revenge story named "Hakone_Reiken_Izari_no_Adauchi", written in 1801. They sought the foe around Yedo(Tokyo). But Katsugorou became cripple(Izari) before revenging(Adauchi) at "Hakone_Yama"(Mt.Hakone near Tokyo). Then Hatsuhana seeked the foe putting Katsugorou on a wagon(Kuruma) and pulling it. At last the couple found the foe. and he accomplished the revenge. This seductive game is almost irrelevantly to the story. maple leaves(Momiji), because of in the mountain(Yama_ga_Yue) it falls snow(Yuki). Hatsuhana(Maiko) says to Katsugorou(Guest); "I guess you wish to make love"
Katsugorou(Guest); "Of course I wish, but you can see this cripple"
saying she sits on him and clings to him. 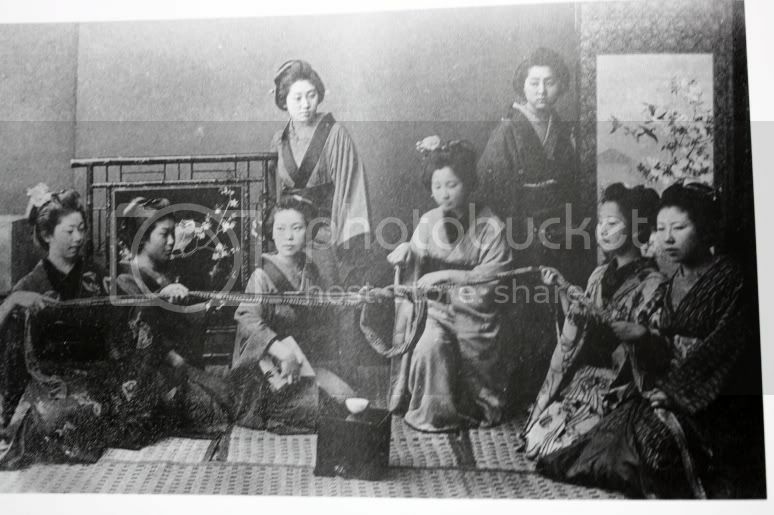 "Chausu" means "woman on top position" Hatsuhana of course is played by the geiko/maiko dragging the scarf. so called "Obi_Age" , in the figure as the picture. And pushs each other the partner's hips. Then a person fell down is the looser. They play and speak each other opposite gestures and opposite saying, except crying. One says and does the gesture "Oyama_no Oyama_no Mattake_ga Hamaguri_hoshii_to naiteita"
And the other says at the same time, doing the gesture "Ohama_no Ohama_no Hamaguri_ga Mattake_hoshii_to naiteita". Gradually the speed of the speaking and the gesture becomes faster. The one mistakes the speaking or the gesture is the looser. Thanks so much to arumuko for all of his explanations! The object of this game is to reach through a loop formed in a cloth and grab an object before the loop is pulled closed. In this case the object is the sake cup. Now if someone can tell me what the purpose is of this game.... I bet you'd never hear of this one in Kyoto. Senri no hashiru youna yabu no naka wo minasan nozoite gorouji masse. Kin no Hachimaki Tasuki ni Watounai ga "En﻿ Yara Ya" to Toraesi Kedamono wa. Tora to-ra to-ra tora, tora to-ra to-ra tora, tora to-ra to-ra tora! Wearing a golden Japanese towel around his﻿ head and a golden cord around his shoulders and upper arms, saying "Yo-heave-ho", Watounai caught a beast. It is a tiger! a tiger! a tiger!